Come explore free, online tools for creating your own polls and surveys. 12:30 HarvardX Ancient Greek Hero: we continue with hour 7, in which we learn to "close read" images as well additional bits of Homer, pseudo-Demosthenes and Pindar. It's not too late to join. Just plunge in. 3:00 Workshop: Introduction to Befuncky and Pixlr, free and impressive photoediting tools. Everyone is welcome. Here are the images for today, assembled by Patti using one of the tools from last week's workshop. The key word for this week is sēma (plural sēmata) which means not only sign or symbol (think sematics and semiotics) but also "tomb of a hero." See the egg-shaped things? Those are the tombs. The little "fairies" flitting about? Psukhes of the heroes. Can you find Achilles? Hector? Andromache? Iris? 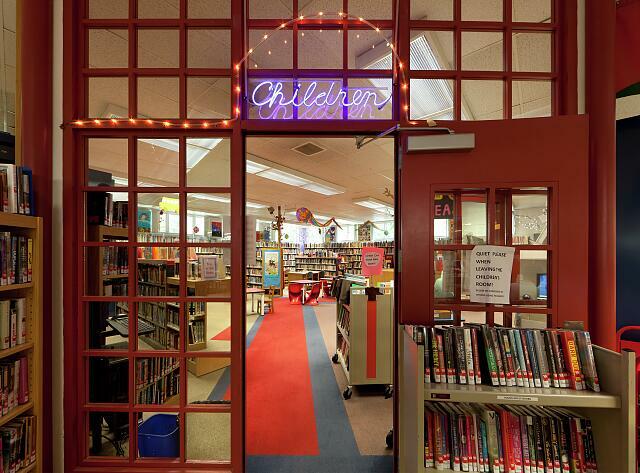 Our neon door to the children's room is now an online jigsaw puzzle. Pictures of the doorway confuse people who don't know our library. Some of the panes are clear glass, others are mirrors. Many thanks to Andris Simsons who used a photo from the Library of Congress' Carol Highsmith archive. And here are more at her web site. 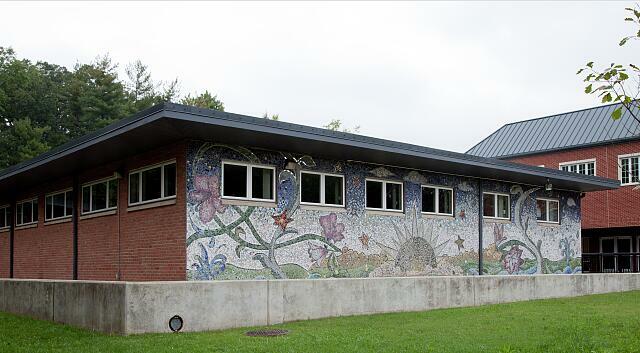 Update: Andris Simsons has created a puzzle from another Highsmith photo of our library, this one of the mosaic wall. Give it a try. We are offering six weeks of short workshops, in computer room A at 4 PM, to introduce you to interesting, free, online tools. Many have corresponding mobile apps. Each workshop will last approximately 30 minutes. These workshops will be repeated on Sundays, starting at 3. Reminder: The library and computer rooms will be open 12-5 starting May 5th. Anyone can participate but many of these sites or apps require parental permission if you are under 13, or 13-18. So you may want to bring a parental consent form or, better yet, bring your parent. If you are underage you are welcome to watch, kibitz, and laugh at staff members trying to create animations.